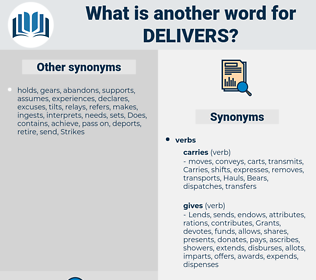 What is another word for delivers? presents, Delivering, supports, casts, helps, hits, champions, pays, features, lays, Genera, puts, sheds, meets. Deliveries, deliverables, promises, assurances, yields, surrenders, renders, displays, visits, expresses, lists, writers, accords, exhibits, conducts, paints, shows, returns, Textbooks, pounds, lets, provides, presents, supports, helps, pays, features, affords. derives, distributes, develops, describes, demonstrates, engenders, Guarantees, transfers, Lends, supplier, defers, issues, incorporates, circulates, relieves, translates, fulfills, integrates, accomplishes, prefers, transmits, improves, pledge, pledges, determines, resells, extradites, coordinates, triggers, empowers, corresponds, receives, forwards, depicts, gathers, exists, considers, defines, Drives, involves, writes, administrates, responsible, provokes, acquires, illustrates, Gives, responds, liberates, confers, caters, attributes, eliminates, procures, handles, lies, furnishes, adheres, broadcasts, explains, conveys, informs, resolves, fills, oversees, realizes, predicts, covers, leads, files, explores, increases, compiles, Presenting, publishes, dispatches, rules, abides, reminds, reflects, depends, fosters, refers, comprises, is, includes, upholds, summarizes, solves, embodies, arranges, protrudes, clarifies, Carries, restores, undertakes, proves, indicates, carriage, collects, reviews, commits, governs, constitutes, propose, proposes, feeds, decides, interprets, realises, moves, breeds, sells, purchases, represents, manages, certifies, attained, attains, prescribes, concludes, outlines, encounters, identifies, creates, spreads, insures, sustains, reads, ceases, discharged, discharges, specializes, ensuring, ensures, answers, underpins, accountable, initiates, follows, portrays, relays, authorizes, regulates, succeeds, targets, recognises, earns, dictates, reaches, relies, entails, speaks, observes, encourages, captures, instructs, transposes, celebrates, results, anticipates, arises, fails, guides, showcases, proceeds, underlines, emphasizes, concedes, approves, vacates, trades, employs, stipulates, promotes, raises, avoids, denotes, Grants, culminates, attends, assigns, holds, recommends, serves, prepares, emphasises, encompasses, admits, contemplates, contains, diffuses, implies, turns, works, imposes, relates, Bears, conforms, highlights, foresees, preserves, operates, suggests, adds, prints, pursues, discusses, aids, waivers, complicates, envisages, assure, assures, adopts, incurs, offerts, draws, entitles, challenges, bids, product, possesses, agrees, forecasts, streams, enters, benefit, benefits, reduces, Emitted, emits, protects, specifies, assesses, enhances, Strikes, accepts, elaborates, populates, embeds, finds, sings, airs, occupies, settles, satisfies, assumes, Institutes, understands, clears, prevents, balances, endows, stores, exposes, enacts, remits, bites, undermines, contends, intends, Gains, outputs, enqueues, buys, stops, With, tells, Comes, cites, trains, exerts, obviates, consists, poses, questions, qualifies, giveth, favours, Exercises, applies, honours, Affects, occurs, appoints, frees, opens, underscores, asserts, monitors, uses, boasts, alleges, argues, bestows, fits, expects, takes, looks, sets, harbours, falls, Faces, notifies, acquits, aligns, Plays, ascribes, unleashes, teaches, exempts, cares, promises, VOTES, shoots, commands, suits, format, FORMATS, starts, unlocks, functions, pushes, pours, sees, stems, Tests, justifies, yields, Has, heads, warrants, Tracks, doubts, runs, accuses, Rests, stands, wins, rock, pulls, owns, places, causes, plans, Focuses, favors, matches, sponsors, tosses, renders, begets, becomes, says, sounds, Forms, passes, keep, keeps, packs, insists, Does, Worries, seeks, calls, displays, goes, asks, Backs, wishes, visits, expresses, lists, accounts, acts, gets, Bases, means, accords, making, exhibits, conducts, paints, shows, wants, returns, lets, presents, supports, casts, hits, throws, features, lays, puts, sheds, affords, meets, makes. 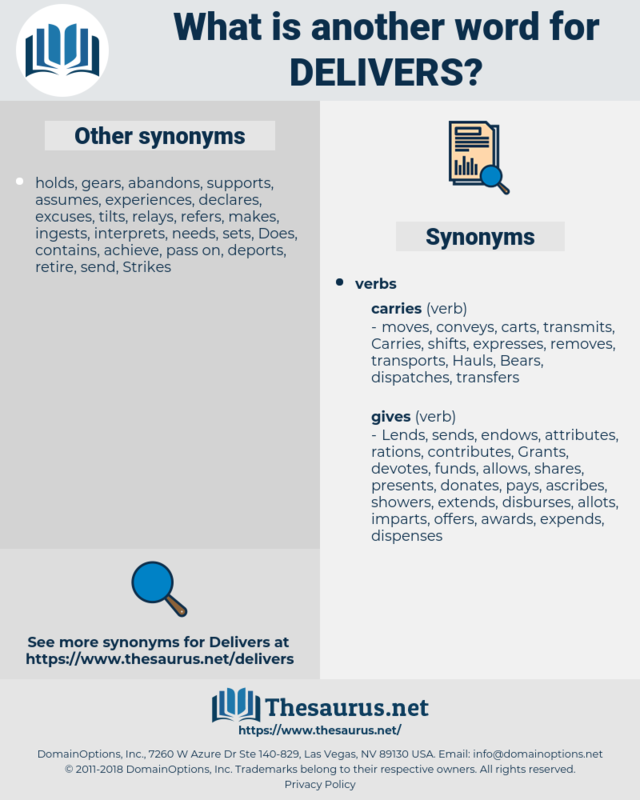 implements, administer, administers, Addresses, produces, fulfils, devotes, dispenses, builds, Replies, discloses, establishes, Leaves, allocates, imparts, executes, complying, complies, enforces, transports, pronounces, Securing, secures, donates, entrusts, maintains, engages, assists, attaches, surrenders, provides, helps, pays, communicate, communicates. deliverer, delivery, Day Labourer, day laborer.